"All the attention he's getting is warranted. He's running unbelievable this year. It's been phenomenal what he's done ... I wish him the best and hope he doesn't get caught up in the hype. When I look at people that I ran against (at 19), there were people who were supposed to be the next big thing and some of them fell off. I hope it doesn't happen to German. He's one of the best guys at his age. I'm looking forward to running against him." - Galen Rupp, former American junior record holder at 5k, talking about the hype and glare surrounding new American junior record holder at 5k, German Fernandez. I'm sorry, but where are the Fans at USATF's!!!!! Alan Webb has better Pr's in ever distance than Rupp. Evan Jager is going to rule the roost. Evan Jager is Amazing - Has the US ever had a 20-year old run 13:22? LRC Rowbury Back Atop The US 1,500 Ranks Christin Wurth made it interesting, opening up a 3-second lead at the bell on Shannon Rowbury, but Rowbury blitzed the last lap in 60 seconds to get the come-from-behind win and put her back atop the US 1,500m rankings. Anna Willard, attempting the steeple/1,500 double, was third. LRC Josh McAdams Gets His 2nd USATF Steeple Crown McAdams held off the challenge from Dan Huling. 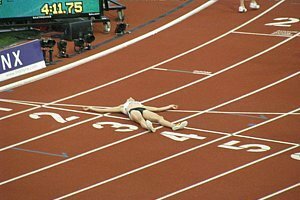 LRC Kara Goucher Gets 5,000 Crown If you thought Kara had given up on the track now that her marathon career is in full swing, think again. Goucher blasted away from Jen Rhines with 500m to go and coasted to her 2nd straight USATF 5k track crown. Goucher will run the marathon in Berlin. NCAA champ Angela Bizzarri moved up for third. Chasing the World Championship "A" standard wasn't the first thing on her mind, as she's never left the country. Goucher's win gave Alberto Salazar-coached athletes 3 of the 4 distance titles in Eugene. 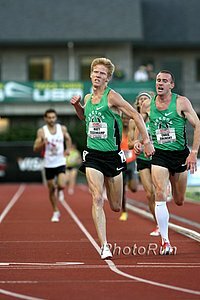 The fourth title (the men's 5k) went to Alberto's co-worker Jerry Schumacher, as Matt Tegenkamp led a 1-2-3 Portland sweep. Day 2 AP Recap: Mike Rodgers Goes From Selling Air Jordans Out Of The Back Of His Car To Winning The USA 100m 9.91w for Rodgers. In the women's 100, Carmelita Jeter outleaned Muna Lee in a fast 10.78w. Olympic Trials Will Be Cut To 6 Days In 2012 This doesn't seem to cut the financial cost on athletes much or reduce the amount of stress on them much (Project 30 goals), but having the Trials over 2 weekends is perfectly fine with us. The old system wasn't broken and the new one isn't much different. LRC Galen Rupp Wins USATF 10k Title link fixed Galen Rupp made it look easy, easily putting away from a surprising Dathan Ritzenhein over the last 500 to win his first USATF title in his last time in the Oregon Duck jersey. Along the way, Rupp dispatched a who's who of American distance running, as veterans Meb Keflezighi and Abdi Abdirahman tried to push Rupp. Rupp's win capped a great day for Alberto Salazar as in the women's 10k final, the Salazar-coached Amy Begley shocked Beijing Olympic medallist Shalane Flanagan in the 10k over the last 150m. More Rupp: Race Results Weekly: BEGLEY AND RUPP GET TWO DRAMATIC USA 10,000M VICTORIES Rupp is the first athlete to win the USATF 10k and NCAA 10k crown in the same year. LRC 800 And 1,500 Recaps We give you analysis on the 800s and 1,500s you won't find anywhere else: Rob Myers Gate, Maggie Vessey's giving us a coronary, and Golden Coachman making the 800 semis with one shoe. Of course we've got the basics like Alan Webb and Will Leer. LRC 2009 USATF Thursday Men's Preview: Rupp's Coronation Or One For Abdi's Thumb? The men's 10k final is the marquée matchup on Friday with the showdown between 4 time US champ Abdi Abdirahman (who ran 27:16 last year) and the hometown hero (and favorite in our book) NCAA superstar Galen Rupp. We break down the deep, deep men's field, which also includes Olympic silver medallist Meb Keflezighi, 2009 US leader Tim Nelson and former US champ Jorge Torres. Also on tap on Thursday is the semifinal of the men's 1,500, which (due to USATF incompetence) includes 51 people. Yes, 51 people will be eliminated down to the final in one round. We break down all the men's action. 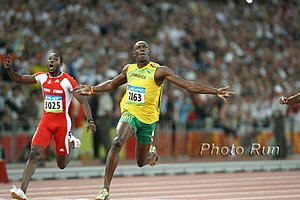 LRCs 2009 USATF Coverage: A Preview of Men's & Women's Jumps Come on; don't pretend to be surprised we have a jumps preview. World record holder in the long jump, Mike Powell, has been a message board visitor to the site for years. 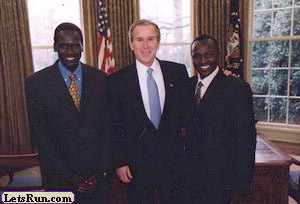 Remember, everyone reads LetsRun.com, no one else links to it, and that's why you love us. We actually are willing to express opinions. LRC Week In Review: Introducing Curtis Beach And Chalonda Goodman Sure, we talk about Usain Bolt, Deena Kastor and Kim Smith, but this week, two high schoolers most of you have never heard of deserve some major props. There seems to be little doubt in our minds that Beach is the best high school athlete ever by a long shot. The scary thing is the national decathlon record holder (who already beats Bryan Clay in 3 events) could perhaps be the best mid-d runner in America as well if he focused on it, as he ran 1:50.75 for 800m this past weekend to get 3rd at NON. Goodman, meanwhile, already is good enough by herself to get in the top 20 as a team at NCAAs. LRC Schumacher's Boys Go 1-2-3 In Men's 5k 20-Year-Old Evan Jager makes World Champs team (well, not officially), German Fernandez gets American junior record. Matt Tegenkamp got the win over training partner Chris Solinsky as they both blasted 53-second final 400s, while 20-year-old training mate Jager finished 3rd. Alberto Salazar To Coach Dathan Ritzenhein It's been a great week so far for Alberto's athletes. *Eugene Register Guard Editorial: As he was as a runner, Salazar is leading the pack as a coach. LRC 800 Semi/Steeple Recaps The favorites made it to the finals. In the women's steeple the water barrier was set at the men's height instead of the women's. LRC Amy Begley Shocks Shalane Flanagan It came down to a thrilling last lap and in the end, it was not the Olympic bronze medallist who came out in top with a Hayward Field record, but the Alberto Salazar-coached Begley. Discus: Stephanie Brown Trafton Wins Her First National Title In Discus, Will Have Corn Dog To Celebrate The Olympic champ had never won USAs before. 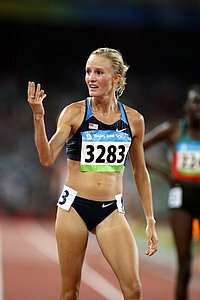 LRC 2009 USATF Thursday Women's Preview: Women's 10k Final: The Shalane Flanagan Show and ??? The women's 10k final is the highlight on the track. We break down the women's 10k final, where Shalane Flanagan is the heavy favorite but will be facing 2008 Olympian Amy Begley and darkhorse longshot Serena Burla. We take a look at some of the other action including the women's discus (where Olympic champ Stephanie Brown Trafton will try to win her first national title; yes, she's got Olympic gold but 0 national titles) and women's high jump (where Amy Acuff, in her last USATF Nationals, tries to make her 8th World Champs team). 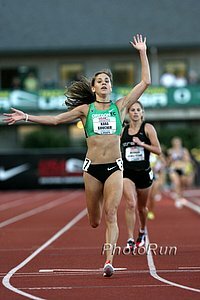 RRW: Working With New Coach Jerry Schumacher, Flanagan Ready To Defend USA 10,000m Title Flanagan, despite setting a PR at the Olympics and getting the bronze medal, changed coaches this year. She's now coach Jerry Schumacher's one and only female athlete, but it sounds like they have big plans for 2009. Remarkably, Flanagan says Schumacher has told her she has a "lot of work to do to before I become a true distance runner."